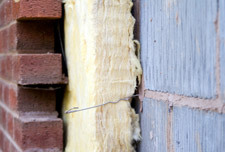 Internal wall insulation is an insulation layer designed to prevent heat being lost from a home. It is normally used in older homes with solid walls where cavity wall insulation is not possible. Typically, insulation is laid between light-gauge steel channels or timber studs fixed to the inside of walls. The channels or studs are then most commonly covered by foil-backed plasterboard (or plasterboard with a separate vapour control layer. Alternatively, composite boards of insulation and plasterboard are glued and/or mechanically fixed to the main wall. Unlike, external wall insulation, interior wall insulation does not affect the exterior appearance of the house, but it does slightly reduce room size. Why choose internal wall insulation? Where external walls are poorly insulated. Where external walls are deteriorating or are insufficiently weather-tight, causing damp, draughts and heat loss. Installing external insulation would adversely affect the appearance of the building. Dramatic reduction in heat loss. Rooms are easier to heat and stay warmer for longer after heating is switched off. Eliminates condensation and resulting mould growth. Improves your home's energy rating. Gives walls a clean fresh look. Helps keep your home cool in summer. Acts as a sound insulator. How effective is internal wall insulation? Internal Wall Insulation can reduce the U-Value of a treated wall to at least 0.5 W/m² K which represents a 400% improvement in thermal efficiency of a typical solid brick wall.